IRTA’s thirty-seven years of advocacy accomplishments have been critical to the advancement of the barter and trade industry. IRTA successfully lobbied U.S. Congress for trade exchanges to be recognized by the IRS as third party record keepers. The TEFRA Act was signed into law by President Reagan in 1982, and as a result effectively legitimized the barter industry in the U.S.
IRTA President, Annette Riggs & IRTA’s Executive Director, Ron Whitney at the headquarters for the Islamic Development Bank (IDB), Jeddah, Saudi Arabia, November 2015. IRTA’s Global Board of Directors meets regularly to set strategies for the advancement of the barter and trade industry and to create innovative new programs. For instance, most recently, IRTA submitted a comprehensive report on December 22nd, 2015 IRTA to the International Islamic Trade Finance Corporation, (the economic development arm of the Islamic Development Bank, IDB), titled “IRTA Report for the Development of an OIC Multi-Dimensional Credit Clearing/Counter Trade System. Every Fall IRTA holds an Annual International Convention in or near the U.S., as well as periodic European/Asian Chapter Conference meetings in Europe or Asia. 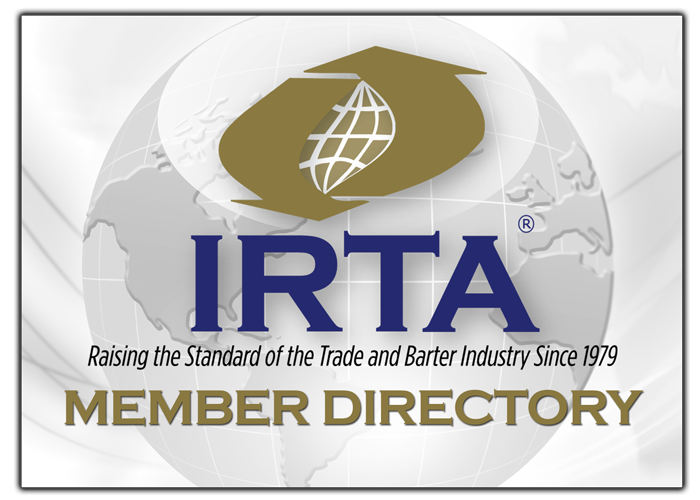 IRTA also offers additional training and educational meetings in other regions around the world to educate and improve the professional competence of those in the Modern Trade and Barter Industry. Established Code of Ethics and voluntary self-regulation for the commercial barter industry. Secured introduction in Congress of H.R. 4201, Commercial Barter Self-Regulation Act. Conducts research on legal, accounting, tax and regulatory issues and monitors IRS, SEC, FASB, FTC and EU. Secured $100,000 for legal fund to defend barter companies against IRS use of “John Doe” summonses in audits. Obtained Civil Aeronautics Board ruling allowing unrestricted barter of air travel. Curbed trade exchange deficit spending through education and self-regulation. Developed model contract setting forth legal powers and responsibilities of trade exchanges and their clients. Lobbied successfully to defeat adverse regulatory legislation in California and Iowa. Helped protect the public by exposing fraudulent barter operations in California. Representative for the Modern Trade and Barter industry with the IRS by serving on the IRS’s “Information Reporting Program Advisory Committee” (IRPAC). Re-wrote the barter portions of the www.irs.gov site for the IRS that pertain to the barter industry. Created and maintains an industry-recognized worldwide trade broker certification RTB and CTB programs to enhance competence and professional standards of trade exchange brokers. Worked with the Australian government to safeguard the practice of barter and created a model from which to regulate the Australian barter community. Created international chapters of IRTA worldwide and created a Community Currency Council for worldwide alternative currency systems. Created the Universal Currency (UC) www.ucci.biz worldwide trading platform for barter exchanges to trade with each other in a seamless manner. 2010: Obtained favorable legal opinion from the North Carolina Bar Association to permit attorneys to participate in organized barter exchanges in North Carolina. The opinion is used as model opinion for other States. 2010: Obtained a favorable ruling from the European Commission recognizing the barter industry’s in the clearing of goods and the issuance of trade credits while also affirming such trade credits are not a security. Such recognition effectively protects European trade credits from EU securities laws. 2011: Produced worldwide press release distinguishing differences between the Liberty Dollars Federal counterfeiting verdict and the organized barter industry and advising the industry the guilty verdict does not negatively effect the barter industry. 2011: Re-Wrote and modernized the IRTA Ethics and Conduct Code, effective September 20, 2011. The new Code includes rules of conduct on numerous topical and relevant issues facing the trade and barter industry. It also includes a tiered disciplinary process for violators of the Code. 2012: Re-wrote and modernized an exchange deficits advisory memo titled, “Guidelines & Recommendations For Barter Exchange Deficits”, dated March 28, 2012. The memo defines the different types of exchange deficits and sets clear parameters for for reasonable and prudent deficits that will result in maximum member trading and proper money supply. The advisory memo also provides methods for deficit reduction so as to allow exchanges to reduce their existing deficits and fall within the IRTA recommended deficit guidelines. 2013: With assistance from the United Nations and the STRO Foundation, provided critical support to a Kenyan based non-profit community currency group (Koru-Kenya Bangla-Pesa’s) to help get criminal charges against the group dropped by the Kenyan government. The project is now operational with government support. 2013: Issues a comprehensive Franchise and License Agreements Advisory Memo which provides the legal parameters for proper franchising and licensing for the barter industry. 2013/14: Provided ongoing warnings to the industry regarding unscrupulous organizations that threaten the prestige and positive reputation of the barter industry. 2015: Received a favorable ruling from the Commissioner and Senior Legal Counsel of the California Department of Business Oversight stating that barter exchanges do not need to be licensed under the California Money Transmitter Act. 2015: Helped obtain Connecticut Bar Association favorable opinion allowing attorneys to barter in Connecticut. The favorable ruling was based on the North Carolina Bar Association opinion of 2010. 2015: Co-developed proprietary software with BPS Technologies for Universal Currency’s sole and exclusive use, (UC is IRTA’s international inter-exchange trading platform). Disseminates new knowledge globally through the internet, training workshops, conventions and Industry forums. Globally recognized as industry spokesman and watchdog, with reputation for impartiality and interviewed by worldwide media on a regular basis.